See examples of other content here. Women for Winesense -Grand Event May 2, 2015 , "More Wine. Less Whine." Sage Fixed Assets Live 2013 August 2013. Wine Industry Technology Symposium July 2013. Moderator "Mobility Progress, Perceptions & Technology Implications " and co-presenter : " Free and Low Cost Technologies for Wineries." 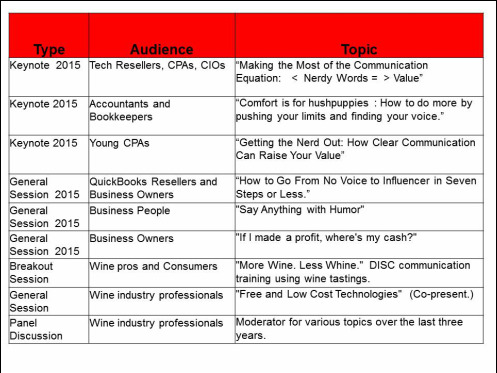 "Bringing Financial Statements to Life"
"Lessons every business can learn from the wine industry"
"10 ways even a nerd can be heard"
"Free and low cost technologies"
"Sharing financial information with non financial people"
"Sales tax: if they audit, your client will pay." Webinar "The Social Equation : CPAs + Social Media = ROI"
Webinar "Bringing Financial Statements to Life"
An Executive Roundtable : " Growing Upstream"
1. "Tales from a Nerd: 10 Secrets to Connecting with Any Audience"
2. "From Customer to Billboard:How to Make Every Customer a Walking Referral Source"